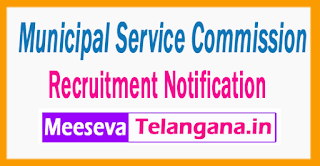 Municipal Service Commission (MSC ) Has Invited Application Form For 06 Assistant, LDC, Surveyor . All Eligible Candidates Are To check Eligibility details for MSCApply Online Before-24-07-2017 All Candidates Applying For MSC Recruitment 2017 - 06 Assistant, LDC, Surveyor , Should Check Vacancy Details - Educational Qualifications & Experiences Requirement, Exam Pattern, Syllabus, Age Limit, Selection Criteria, Admit Card, Results, Exam Date, Before Applying. INR Rs. 9,000 - 40,500/- With 4400/- Grade Pay (Post 1), Rs. 7,100 - 37,600/- With 3600/- Grade Pay (Post 2,3), Rs. 5,400 - 25,200/- With 2600/- Grade Pay (Post 4,5). All Candidates upper age limit should not Exceed 18 years and 40 years 01-01-2017 Age relaxations will be applicable As per the rules. All Interested Job Seekers should have completed 10th, Diploma in Architecture / Survey/ Draftsmanship or its equivalent qualification from A recognized Board/University. All Eligible candidates may fill the online application through official website (http://www.mscwb).org.before or on 24-07-2017. Last Date for Registration of Online Application Form Is- 24-07-2017.